I must admit, I’ve never made a cheesecake before and I’m kinda scared to attempt it. But I was having a friend over for dinner last night and I wanted to make a yummy dessert to go along with my favorite dinner, Parmesan Crusted Tilapia, Parmesan Roasted Green Beans, and hush puppies. I actually made my hush puppies from scratch last night, but wasn’t really pleased with them, so I have some work to do to come up with a better hush puppy. 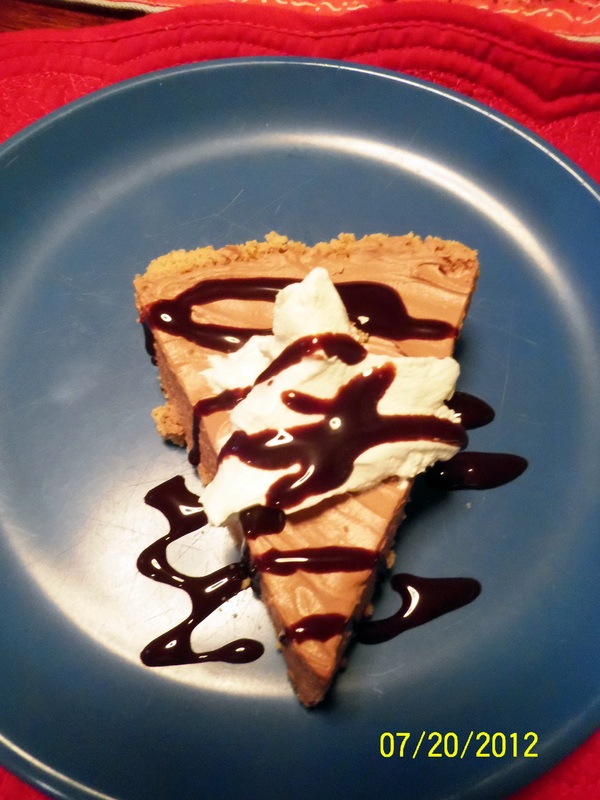 But back to the dessert….I came across a no bake chococlate cheesecake that looked easy enough. I mean, really, can you mess up a no-bake cheesecake? I figured if anyone could, I could. But I gave it a whirl and it turned out perfect, so I had to share it! I did cheat and buy a graham cracker crust. I have had bad experiences in the past trying to make graham cracker crust and since I was making this for guests, I wanted to be sure it would be good. Beat cream cheese with mixer till smooth and creamy, then add cocoa and beat till well blended. Add vanilla, blend again. Slowly add powdered sugar and continue blending cream cheese mixture. Once well mixed and creamy, fold in whipped topping until color is uniform. Pour into graham cracker crust and let chill for 1-2 hours. Top with Cool Whip or drizzle with chocolate syrup. This was so yummy and definitely not diet-friendly. You could opt for the 1/3 less fat or fat free cream cheese and the Light or fat-free Cool Whip as well. But sometimes you just have to splurge!! It is very hard to eat just one slice of this, but it is very rich, so start off with a thin slice!! Let me know if you get a chance to make this and how you like it! It was so easy and good, I will definitely be making this again and again!! Tonight, I made a delicious meal that my daughter wouldn’t eat, until we were clearing off the table. See, my daughter is either a picky eater, or in a rut and I haven’t offered enough variety in the past to where she won’t try anything new. So as I was clearing off the table and getting ready to throw her uneaten dinner out, she decided she wanted a bite because she wanted to go to Starbucks. She ended up eating her whole helping and kept saying “Delicious! I love bowtie pasta now!” This girl is something else. Anyway, on to the recipe…I know you are dying to run in the kitchen and make this now!! *Brown ground beef with onion and garlic. Put in crock-pot and add sauce, tomatoes and seasonings. Cook for 6-7 hours on low. Add the last 4 ingredients during the last 30 minutes of cooking and turn crock-pot to high. I added the spinach, pasta, parmesan and 1 cup of the mozzarella and I mixed it all up really well. Then I added the last 1/2 cup of mozzarella to melt on the top. I hope you get a chance to make this because it is delicious!! Let me know how you like it!! Ok…so I have been MIA lately between my daughter having strep throat a few weeks ago and me having 2 teeth pulled within a couple of weeks, I didn’t even feel like eating, so why cook?? But now that we are all back to normal, it’s time to get cooking again. We’ve been eating out or eating fast food or meals that I’ve already posted on here so now it’s time for some new recipes. 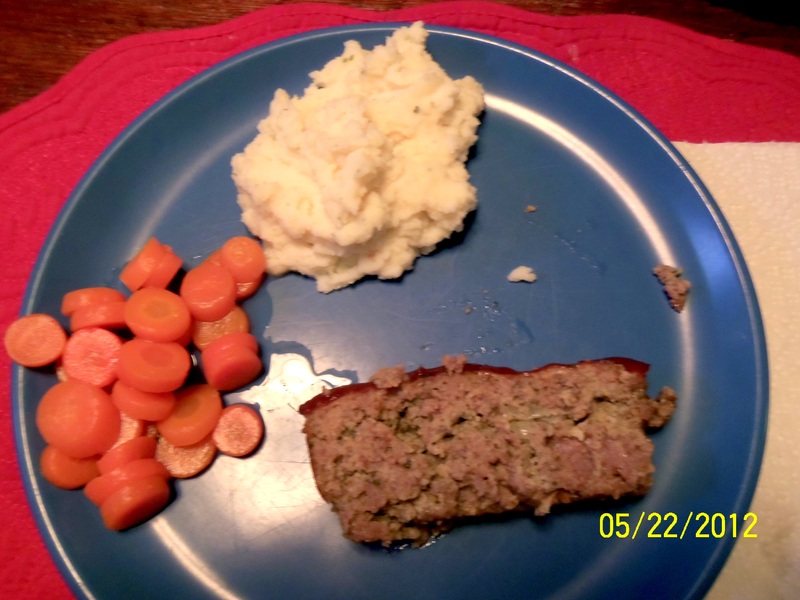 Tonight, I made an oldie but goodie…Meatloaf!! It was super yummy and I think it was because this time I mixed in some ground pork with the ground beef and it was delicious!! 1. In a medium bowl combine eggs and milk; stir in bread crumbs, onion, parsley, salt, sage, and pepper. Add ground meat; mix well. Lightly pat mixture into an 8x4x2-inch loaf pan. 2. Bake in a 350 degree F oven for 1 to 1-1/4 hours or until internal temperature registers 160 degrees F. Spoon off fat. In a bowl combine ketchup, sugar, and mustard; spread over meat. Bake for 10 minutes more. Let stand for 10 minutes before cutting into eight slices. This was delicious and everyone loved it….except for Cheyenne. She was in a mood tonight and wouldn’t even try it even though last time I made meatloaf, she loved it!! 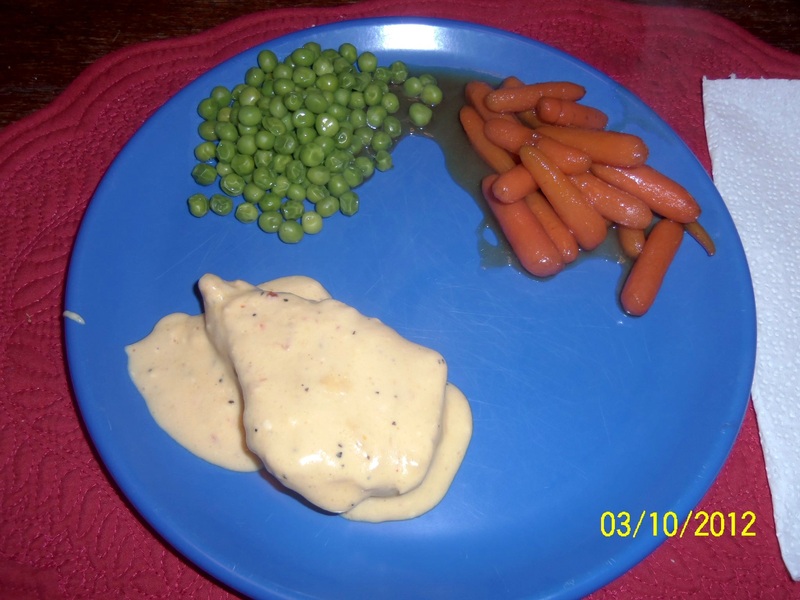 I also fixed her favorite, carrots and mashed potatoes with it so she had carrots and mashed potatoes for dinner…..and no dessert! Haha…. 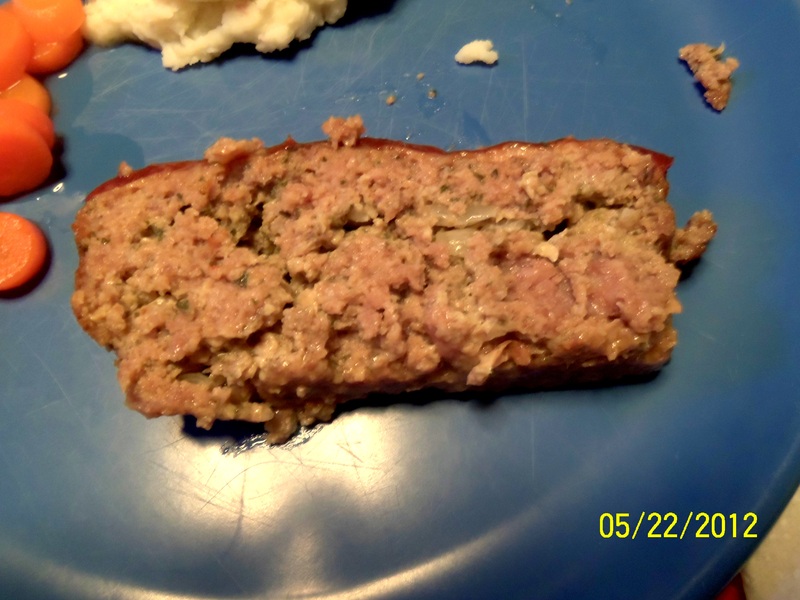 I’ve always made meatloaf with just ground beef before and have seen recipes and heard people talk about using turkey, pork and/or veal mixed with the beef. I decided to try pork and it was so delicious and I think I will make it this way from now on!! Let me know if you get a chance to try this!! I made the best potatoes last night and ate way too much!! I found this recipe at Plain Chicken and had to try it. They are absolutely delicious and next time I will have to half it or maybe even divide it into thirds and freeze the others for later. It makes a lot and for just the 4 of us (although Cheyenne didn’t eat any) it was way too much. I even had a plate of it for lunch today. I love red potatoes and I love them roasted in the oven and I am constantly looking for new flavors to make them. 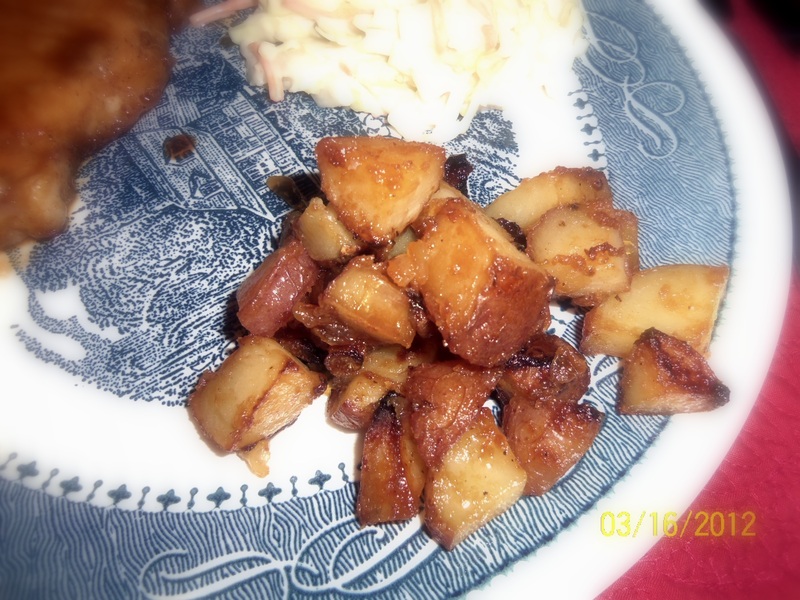 I tried these Honey Roasted Red Potatoes tonight and they were amazing!! Preheat oven to 375 degrees. Line a baking sheet with foil and spray with nonstick cooking spray. Place potatoes in a single layer on the baking sheet and top with onion. In a small bowl, combine butter, honey, mustard, salt and pepper; drizzle over potatoes. Mix thoroughly to coat all of the potatoes. Place back in a single layer. Bake for 40 minutes or until tender, stirring a couple of times during cooking. Stir one more time and turn on broiler and place under broiler for about 2-3 minutes. These were so yummy and went perfectly with the Glazed Pork Chops. Let me know if you get a chance to make these and how much you love them!! I made a delicious dinner tonight and it was devoured by everyone! I love pork chops and I’m always looking for different ways to fix it. Tonight I made Glazed Pork Chops adapted from a recipe I found via Pinterest from Budget Bytes. This had such good flavor and I adapted the recipe and made it a little different and it was amazing! I will definitely be making it again. In a bowl, combine brown sugar, paprika, garlic powder, salt and pepper. 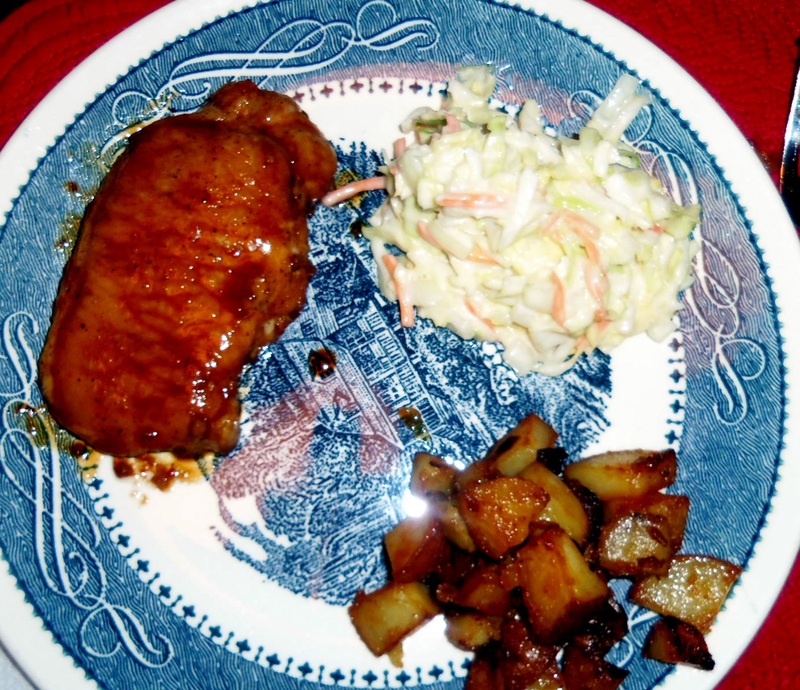 Take pork chops out of package and rub the brown sugar mixture all over both sides of each pork chop. Make sure you use all of the mixture. Heat 2 tablespoons of olive oil in a skillet over medium-high heat. When the oil is hot (it will look wavy in the pan) add your pork chops. Cook the pork chops for about 5 minutes on each side. Add some brown sugar to each side and cook for about 4 or 5 more minutes per side or until cooked through. I really love brown sugar, so I added a handful of brown sugar each time I flipped it and they were amazing. Place on a serving platter and pour/spoon glaze from skillet over the chops. These had such good flavor and everyone loved them. I made some yummy coleslaw and Honey Roasted Red Potatoes to go with this and it was a delicious meal! Let me know if you have a chance to make this and how you like it!! I made these the other night with the Crockpot Italian Chicken and they were delicious! I love carrots and these had such great flavor, there wasn’t any left over. In a medium skillet, heat the butter, sugar, and maple syrup over medium heat, stirring until smooth and the butter is melted. Add the carrots and toss to coat. Cover and reduce the heat to low. Simmer for 15 to 20 minutes or until the carrots are tender and glazed. I had to cook mine a little longer, because I turned my burner too low on the stove. Once I turned it back up to medium instead of simmer, they finally started to soften and I could have cooked them a little longer to soften a little more, but the rest of the meal was ready and they had softened up quite a bit. 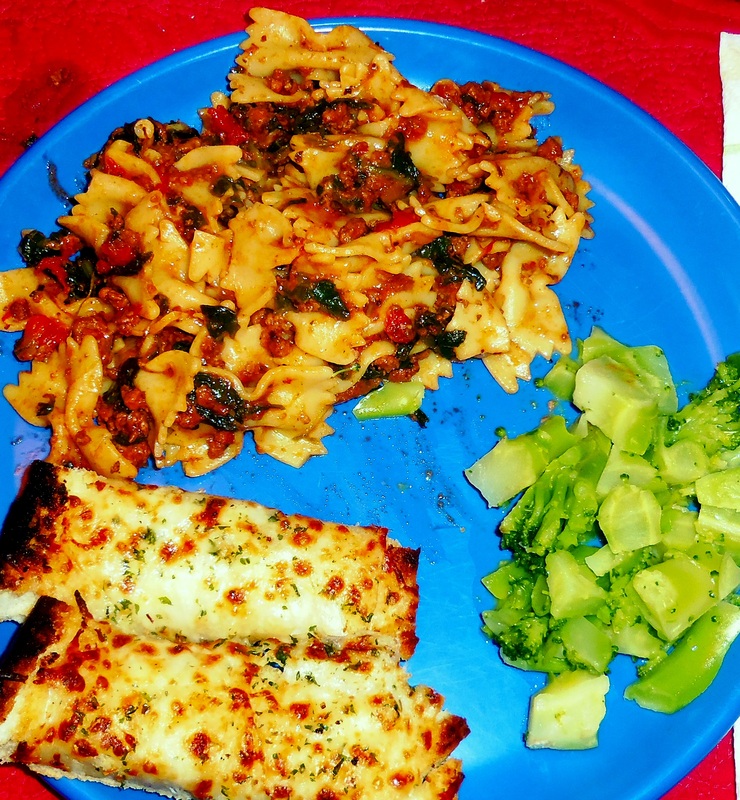 Here’s the delicious dinner we had…. Let me know if you get a chance to make these and how you like them! !